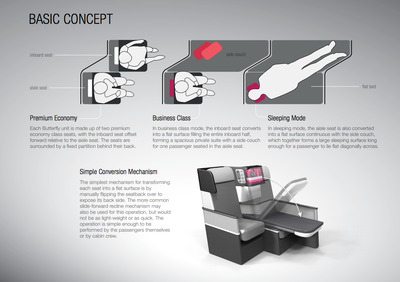 Designers at Hong Kong-based PaperClipDesign have come up with a concept — called the “Butterfly Seat” — that affords passenger airlines an unprecedented level of flexibility in arranging the premium sections of their cabins. 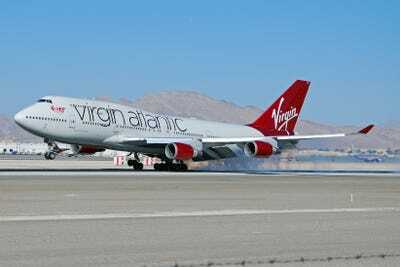 Airlines in search of increased profits have been investing heavily in premium cabins at the front of the plane. First class get suites and beds. 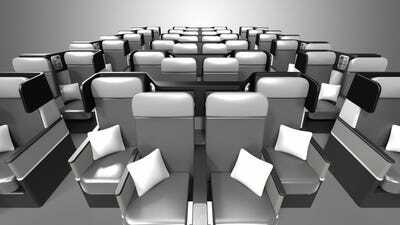 Business class gets converted lie-flat seats. 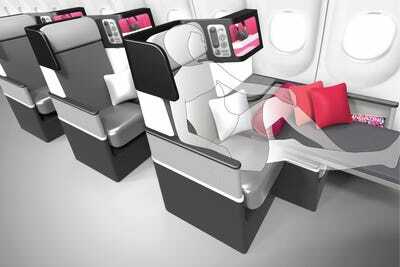 Premium economy gets slightly wider coach seats with more legroom. PaperClipDesign wants to change that with the Butterfly concept — so-named because the seats can transform. For example, if a passenger wants to upgrade his or her business-class seat to a first-class seat, it’s now possible for the airline to make that change with the press of a button. Instead of having to search for an open first-class seat, the airline can simply convert the passenger’s existing business class seat to a first-class bed — and easily reap the added revenue. Airlines can modify their mix of seating options, as well, depending on expectations of passenger preferences in different markets or on different routes. 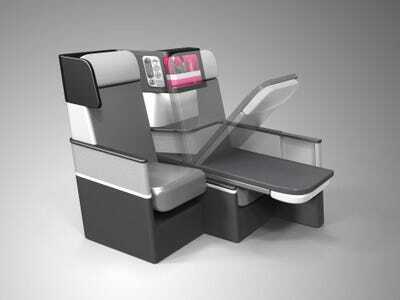 The basic genius of the Butterfly seat design is that an airline can now have uniform design for its premium cabin. 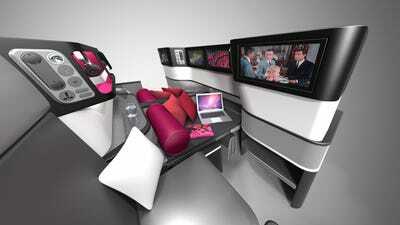 In theory, the cabin can now be all first class, business class, or even all premium economy. 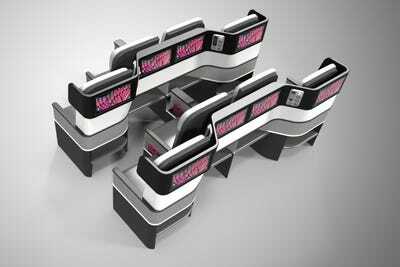 An airline can tailor the seating to customer demand. Everything can be changed at the push of a button! Here's what the three configurations look like. 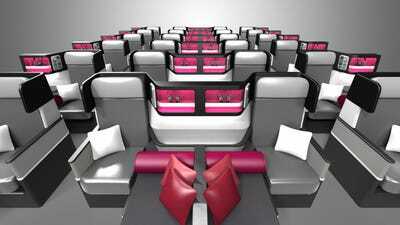 In premium economy, passengers sit side-by-side in a staggered layout, which gives flyers more elbow room. 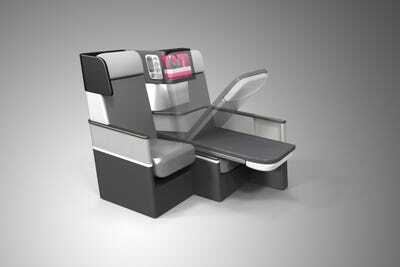 In business class, the Butterfly seat can become a private suite, with the added privacy provided by a side couch. 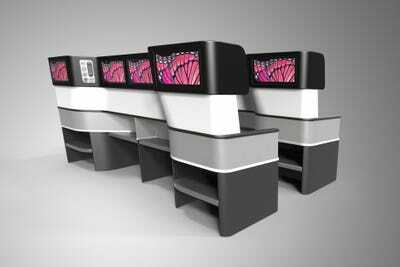 If the business-class seat is converted from premium economy, the flyer would also get access to two entertainment screens, rather than one. Business flyers can even invite family and friends on the flight over to hang out on the couch. 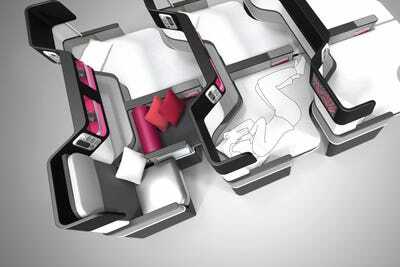 The Butterfly seats convert into full beds in the first-class format. All those seats get their own massive entertainment screens. 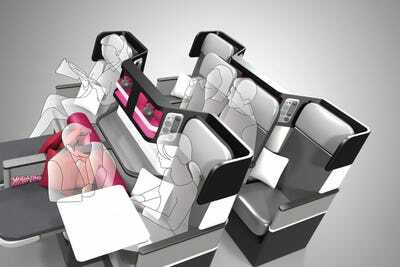 The seat's designers estimate that airlines using a business-class-heavy Butterfly layout on a popular route, like London to New York, can increase the number of passengers onboard by 40% and increase revenue by 5.7% on an Airbus A330 widebody jet. 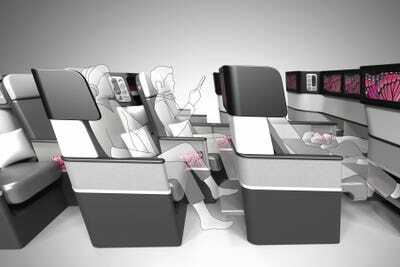 The designers also estimate that airlines can increase the number of passengers on each flight by 11% and revenue by 9.1% by converting first- and business-class seats to call premium economy seats on vacation or short-distance flights. Airlines looking to adopt the Butterfly design can choose from a variety of sizes, based the aircraft being flown and needs of customers. So far the Butterfly seat is only a design proposal, but with with PaperClipDesign's award-winning track-record and the firm's interest in making flying a better experience, it's certainly plausible that we'll see these seats on a trip in the not-too-distant future.